With an entertaining World Series being played and the Cubs big hire of Theo Epstein from the Red Sox it seems there is a lot going on in the baseball world as we approach the close of October. Sadly, this past Friday baseball and the Cubs lost a great friend as Cactus League stalwart Robert Brinton passed away unexpectedly. Robert was one of the a key leaders in helping the Cubs secure the new spring training complex to be built at Riverview Park in Mesa. He was also a past president of the Cactus League Association and 20 year board member, the current executive director of the Mesa Convention and Visitors Bureau, as well as a former leader and longtime member of the Mesa Hohokams. Robert was a huge Cubs fan, and worked tirelessly for the last 50 years to make the Cactus League the success it is today. As former Hohokam Stadium manager and current D-Backs manager of Spring Training Operations Dave Dunne said in this article about Robert , “He was this generation’s Dwight Patterson.” Patterson is known as the father of the Cactus League and made the deal to help move the Cubs to Mesa for spring training beginning in 1952. Robert’s father was one of the original members of the Hohokam group formed by Patterson and Mesa business leaders in the early 1950’s to help with Cubs spring training. Which essentially meant Robert was around spring training and the Cactus League since he was an infant. I never heard a negative word spoken about Robert Brinton and those who met him seemed to universally agree he was one the nicest, most helpful, self-effacing people you could ever meet. I got to know Robert while he was a Hohokam member at Cubs spring training and was lucky to be able to call him a friend for the past two decades. Most recently I worked with Robert extensively on one of his passions the Mesa Historical Museum’s exhibit, Play Ball – The Cactus League Experience. While Robert’s list of accomplishments is long, he never sought publicity for himself, he was too busy helping others. Robert exemplified kindness every day in his actions. I’m reminded of a day last year when Mesa honored Ron Santo on 10-10-10 with a day dedicated to the former Cubs third baseman and broadcaster. 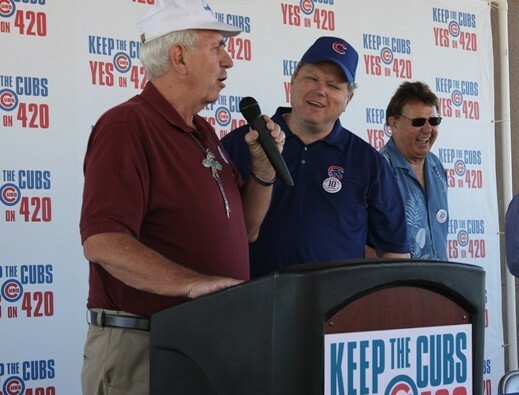 Both men, Ron and Robert were helping out as usual, on that occasion promoting Proposition 420 to help create a new spring training complex for the Cubs. Ron was signing autographs at the end of the event, when Robert came to me and asked if I could take a photo for him, I said sure. An older disabled man was in line to get Ron’s autograph and Robert asked the man if he might like to have a photo taken of Ron and him together, the guy’s face lit up with a smile as wide as the grand canyon. I forwarded the photo to Robert who gave it to the gentleman. A small act of kindness, the kind Robert did over and over on a daily basis. He will be missed.